The U.S. Coast Guard fired at an Iranian fishing boat in the Persian Gulf on Tuesday, nearly adding to a long list of global headaches for President Obama. Fortunately, the incident ended quickly with nobody hurt, Pentagon spokesman John Kirby said, according to a CNN report. 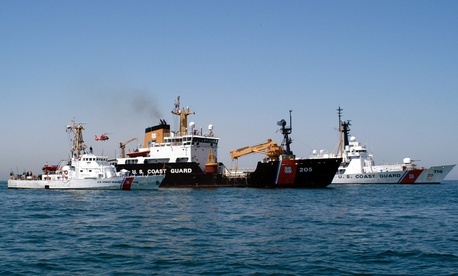 The Iranian boat had pointed a weapon at the American crew, Kirby said, prompting a single shot from the Coast Guard vessel. "I don't know whether the shot was just a warning shot, or it hit the dhow," Kirby said, according to CNN. "In any event, it pulled away and nobody was hurt." Kirby said the Coast Guard was performing a "routine maritime mission" in the Gulf. According to a Department of Defense news agency report, "U.S. military rules of engagement state that unit commanders always have the inherent right and obligation to exercise unit self-defense in response to a hostile act or demonstrated hostile intent."